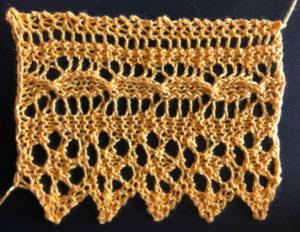 This week’s knitting pattern is based on a knitted doily edging from 1884. The reason it took me two weeks to get this one online, rather than giving it to you last week is because I had to rework the way the diamonds transition from one to the next, and kept changing my mind about how to do it, which meant a LOT of knitting. I hope you enjoy the new pattern for the Knitted Diamond and Flag Border. 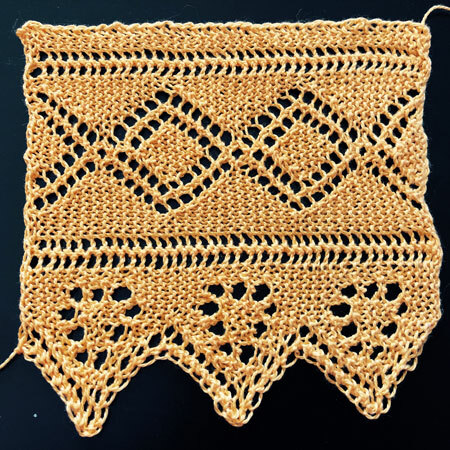 If you enjoy knitted lace edgings, don’t forget to check out the whole collection! My collection of knitted collars (because they’re usually just big edgings), insertions and edgings. New Lace Edging from 1911! 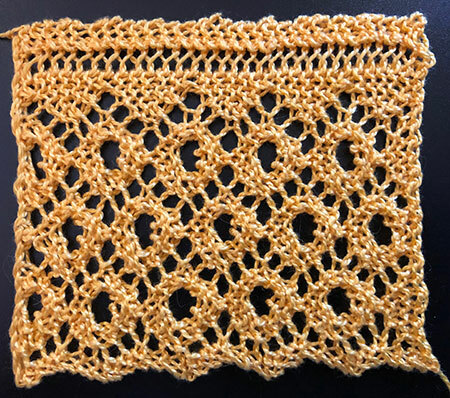 This week’s new knitting pattern is a lovely lace edging from 1911, The Dorothy Knitted Lace. 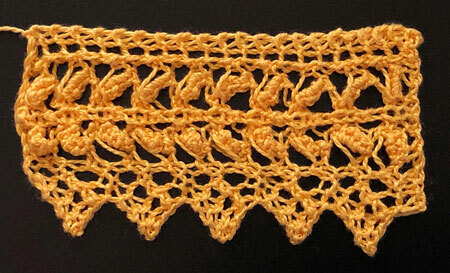 This lace edging is a nice addition to what I call the “English Laces” here on Knitting-and.com (since the first lace edging of this style that I found was called English Lace). You’ll find the others in the ever-growing Lace Collars, Edgings and Insertions collection, which I update regularly. As always, I have updated the knitting terms used in the pattern, charted it and checked it for errors. If you are enjoying the new knitting patterns, don’t forget to subscribe to the site over on the left (on desktop), or underneath this post if you’re on tablet or mobile. You’ll receive an email whenever I post something new. 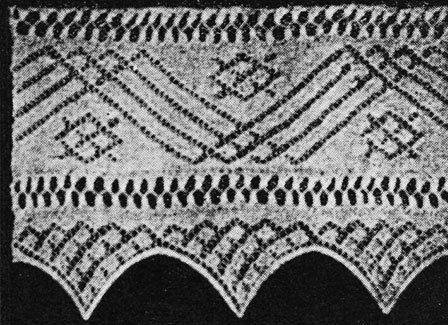 This week’s knitting pattern is a stunning wide lace edging from 1911: Knitted Lace in Points. I’ve updated it into modern knitting terms and made a chart to download as a pdf since it’s such a large lace edging I’ve broken up the chart over three pages. I also used stitch maps to make sure there weren’t an errors. It’s important to me to make these antique laces available once more, in forms that modern knitters can use easily. I’ve been adding them to Knitting-and.com for over 20 years and still have several hundred to go! Check out the lace collars, edgings and insertions page for 180 more that are already available.